Όπως σχεδόν κάθε προηγούμενο Call of Duty, έτσι και το Call of Duty: Black Ops 4 έχει βαρβάτη συλλεκτική έκδοση. 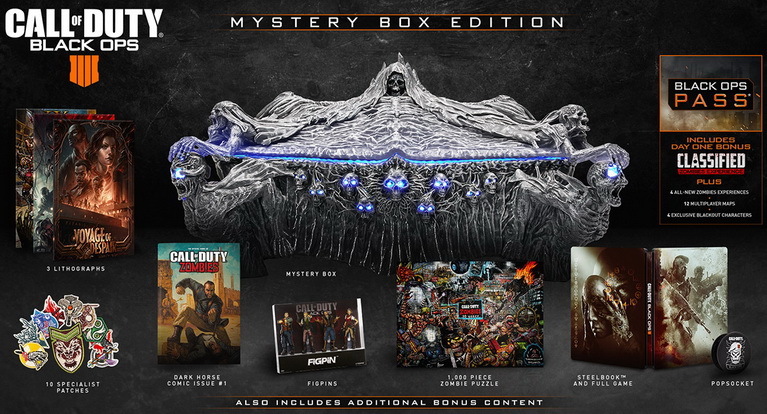 H Activision ανακοίνωσε τη Mystery Box Edition του Black Ops 4, η οποία έρχεται σε θεότρελο κουτί με εμφάνιση και ήχους βασισμένα στο zombies mode. Δείτε αναλυτικά περιεχόμενα και εικόνα (κλικ για φουλ μέγεθος) παρακάτω και πείτε μας εντυπώσεις! • COLLECTIBLE ZOMBIES MYSTERY BOX – Inspired by the in-game Zombies Mystery Box, this collectible box features an eerie skeleton exterior along with frightening sounds and lighting. • 10th ANNIVERSARY ZOMBIES PUZZLE – This 1,000-piece puzzle features unique art celebrating 10 years of Treyarch Zombies history. • DARK HORSE ZOMBIES COMIC ISSUE #1 – This first issue of the Call of Duty: Black Ops 4 Zombies Dark Horse Comic comes with an exclusive cover only for the Mystery Box Edition. The comic series will unveil details about our Zombies Heroes’ backstories. • ZOMBIES LITHOGRAPHS – These three collectible lithographs commemorate Voyage of Despair, IX, and Blood of the Dead, three Zombies Experiences in Call of Duty: Black Ops 4. • COLLECTIBLE STEELBOOK™- Limited edition SteelBook game case featuring unique art. • LIMITED EDITION SPECIALIST ICON PATCHES - Call of Duty: Black Ops 4 reintroduces the fan-favorite Multiplayer Specialists, each with their own unique weapon, equipment, and icons. This set of collectible patches is inspired by each of the 10 Specialists’ in-game icons. 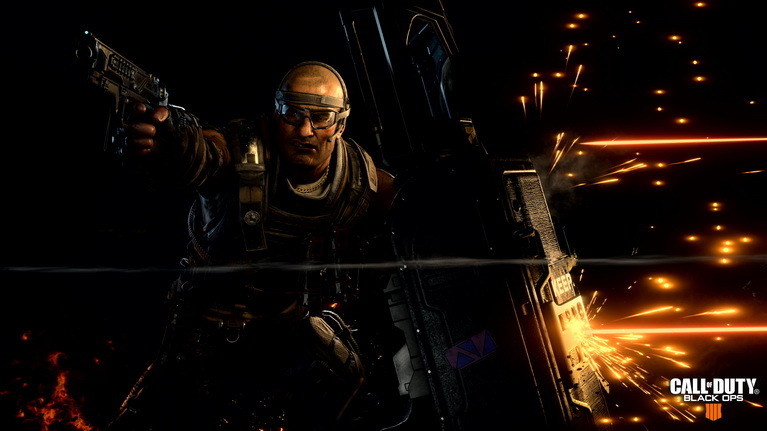 • BLACK OPS PASS- The Call of Duty: Black Ops 4 Black Ops Pass includes Classified, a bonus Zombies experience, available at Launch, 4 additional all-new Zombies experiences, 12 Multiplayer maps, and 4 exclusive Blackout characters.